Currently, China’s per-capita carbon emissions stand at 6.8 tons, which contrasts quite distinctly with the US’s 16.9 tons in per-capita emissions. But with a country industrializing as fast as China, many have expressed concern over the resulting environmental impact associated with such rapid development. 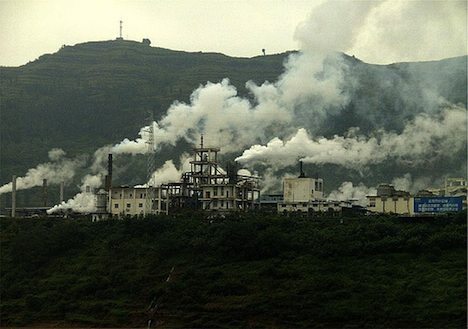 Since 1990, China’s per-capita greenhouse gas emissions have risen nearly three-fold. If current rates continue, China’s per-capita greenhouse gas emissions could surpass those of the United States by 2017. But according to Mr. Xie, surpassing the per-capita carbon emissions of the United States is not an option. Instead, the Chinese government has put in place a five year plan which projects economic growth of 40% by 2015, but a reduction in carbon intensity of 17%. By 2020, China seeks to increase energy efficiency by 40 – 45%. These aren’t just empty numbers either. According to Xie, these numbers are legally binding within China’s domestic context. In terms of renewable energy, China has already surpassed the U.S. in installed wind power and has plans to increase its solar capacity to 10GW by 2015. However, China’s stated development plans are not just good for the future Chinese economy and environment. They also have indirect benefits by providing other developing countries with a greener alternative than the now outdated U.S. development model. If China can prove it can achieve high levels of economic development with far less environmental impact than the U.S., other developing countries such as India and Brazil may jump on board as well. What are your thoughts on China’s development model so far? Do you think China will be able to achieve increasing economic development without surpassing the US’s per-capita greenhouse gas emissions?